Here is a 33 year old lady from Phoenix, Arizona who was seen in our North Scottsdale medical office after major weight loss. She requested plastic surgery after major weight loss. She requested management of the excess skin she developed after loosing 100 pounds. She mentioned that without gastric bypass surgery or other type of bariatric surgery, she was able to lose that weight and felt healthier. We discussed thigh lift, arm lift, body lift and breast surgery during the consultation. Before body contouring surgery, she is 5 feet 5 inches and 175 pounds. She was also a very deflated B cup and desired a full D Cup and a breast lift. After our informative consultation, she decided on an arm lift and breast lift as a combined procedure. This was her priority, and felt she could wait on having a body lift and thigh lift at a later time. 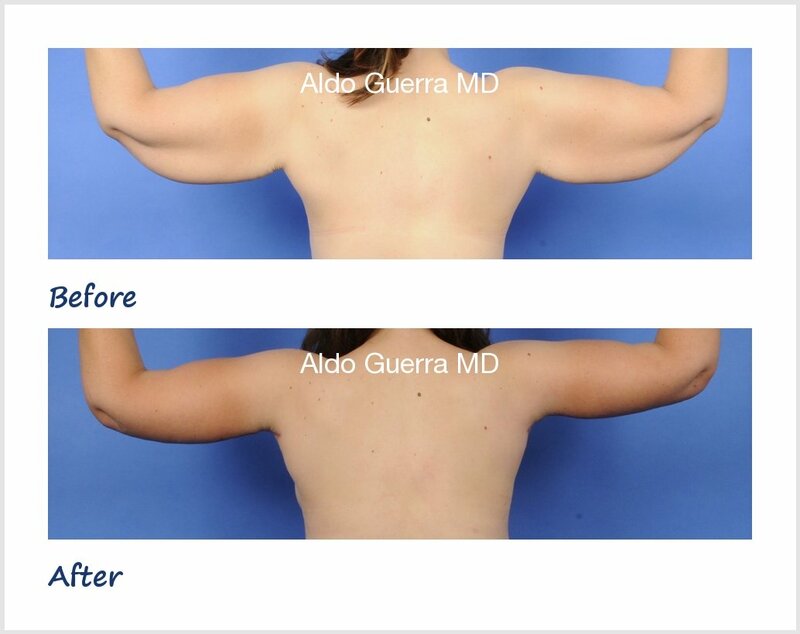 She had her posterior arm lift surgery and axillaplasty at a local plastic surgery center in Arizona, this included hiding the scar in the back of the arm (no scar in the front), and she is shown 3 months after cosmetic surgery in the photographs. She also has a anchor pattern breast lift and placement of 425 cc silicone gel breast implants under the muscle. enjoying her tight, new arms and her full, round and beautiful breasts.